Stretching for approximately 350 miles between Los Angeles and San Francisco, California's Central Coast is a paradise for active adult retirees. Exciting recreational attractions offer a wide range of activities, while ocean views and blue skies provide plenty of scenic beauty. 55+ communities in the Central Coast dot the rugged landscape for those who can afford to live in this somewhat pricey destination. Active adult communities in the Central Coast are contained in four distinct regions: The Channel Islands, Santa Barbara, San Luis Obispo and Monterey Bay. Each area has its own attractions, which include beautiful beaches as well as rolling hills and majestic mountain views. The Central Coast also has a growing reputation for its thriving vineyards, making it a dream location for oenophiles. The Central Coast is a series of ridges that stretch from just north of Los Angeles to Monterrey Bay, bordering the Pacific Ocean to the west and the Central Valley to the east. This mountainous ridge is called the Coast Ranges and is up to 50 miles wide and as high as 9,000 feet, creating perfect recreational options for the residents of active adult communities in the Central Coast. Unlike Southern California s consistently warm and dry climate, active adult communities in the Central Coast enjoy a more Mediterranean climate with a rainy season that runs from November through April, raining on an average of 50-60 days a year. Snowfall is very infrequent except at high elevations. Like the rest of California, age-restricted communities in the Central Coast enjoy a pleasurable, mild temperature throughout the year with very little fluctuation. The temperatures in the Central Coast average in the upper 60s during the summer and the mid-50s during the winter. The cooling effect from the ocean means that 55+ communities in the Central Coast enjoy a milder climate than those who live in the valleys to the west. The southernmost region of the Central Coast is the Channel Islands region that includes the coastal cities of Oxnard and Ventura. Age-restricted communities in the Central Coast enjoy a rich agricultural region which features small farms and vineyards. Historic districts promote the local arts scene and outdoor enthusiasts will love exploring Los Padres National Forest. Further up the coast is Santa Barbara with its charming, pedestrian-friendly downtown area. This luxurious area is known for its extravagant homes and exciting Spanish influence. Art lovers will not want to miss a visit to the Santa Barbara Museum of Art, and everyone can appreciate the beauty of the Santa Maria Wine Country and history buffs will love exploring the Santa Barbara Mission. About halfway between Los Angeles and San Francisco, the San Luis Obispo Region offers everything from outdoor activities to historic sites and tours. Active adult communities in the Central Coast area are near the San Luis Obispo area, home to the famous Hearst Castle, the classic Pismo Beach surf town and breathtaking coastal bluffs. At the northernmost end of California's Central Coast is the Monterey Bay region just south of San Francisco. 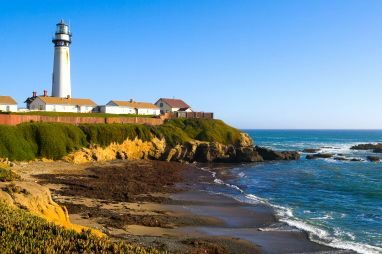 This well-known area includes some of California's most popular attractions including impressive redwood forests, the cliffs of Big Sur and the artistic atmosphere of Carmel. Monterey Bay also includes Cannery Row and the world-class Monterey Bay Aquarium, creating several cultural opportunities for residents of active adult communities in the Central Coast. Age-restricted communities in the Central Coast of California, much like the rest of the state, are in one of the most expensive places in the country. Santa Barbara is about 20 percent more expensive than the rest of California and about 55 percent more expensive than the rest of the country, with home prices being nearly three times as much as the rest of the country. San Luis Obispo offers a little more relief for 55+ communities in the Central Coast region, being half as expensive as the Santa Barbara area. Monterey County provides the best deal for 55+ communities in the Central Coast, with an average cost of living that is just 2 percent higher than the national average. California has a high tax rate, with a 7.5 percent sales tax and a 13.3 percent individual income tax, some of the highest rates in the country. California residents do have some relief in having untaxed Social Security benefits and some tax relief programs for low-income residents. Active adults and retirees who choose to call Central Coast home can qualify for a $7,000 reduction in the taxable value of their property. 55+ communities in the Central Coast have access to a wide array of hospitals such as the Santa Barbara Cottage Hospital. Active adults in the Central Coast also enjoy proximity to French Medical Center in San Luis Obispo, ranked in the top ten in the country for joint replacement. Monterey County residents also have four major hospitals with Community Hospital of the Monterey Peninsula, George L. Mee Memorial Hospital, Salinas Valley Memorial Healthcare System, and the Navidad Medical Center.